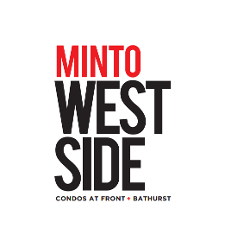 Minto Westside Condos - Register now for your VIP Access! Coming soon to the corner of Bathurst Street and Front Street West in Toronto will be a new development in pre-construction by the Minto Group known as Minto Westside Condos with phases 1 and 2 to launch Fall of 2014 and expected completion date is 2017. Minto has been in business for almost 60 years and it all started with four brothers from Ottawa who wanted to build better quality designed homes. Today, they are award-winners having operations in Toronto, Ottawa, Calgary and Florida with a huge portfolio of residential, commercial and retail properties across the country. Minto Group is a developer who's also leading the way in building better and greener buildings winning the Green Builder of the Year award two years in a row by the leading provider of residential green building services, EnerQuality. Minto has consistently achieved 25% or more in energy savings in high and low-rise communities. They are the green building industry leaders. When you buy a property from Minto, you know that you're doing your part in helping out the environment and while you're at that, you're saving money too with reduced energy bills. Queen's Landing - Singles and Towns currently in pre-construction in East Gwillimbury, Ontario with prices starting from the low $300,000's. About to launch soon. Minto 30 Roe - A new condominium development currently under construction and still selling in Toronto, Ontario set to be completed in 2016 and is still selling with 34 storeys and 395 units. Unit size range from 588 square feet to 862 square feet with prices from $360,900 to over $529,900. WaterGarden - A luxury condominium development completed in 2014 and is still selling in Thornhill, Ontario with 6 storeys and 212 units. Unit size range from 552 square feet to 1,620 square feet with prices starting from $299,900 to over $895,500. Finally there's this Front and Bathurst local project designed by a Toronto architectural firm who developers gravitate to, the Wallman Architects. They are the masterminds behind the astonishing design and style at Yonge and Eglinton Minto30Roe project. Burdifilek, a design firm who has won over 100 awards and specializes in luxury design and also based in Toronto will be putting their mark on this Westside project as well. Minto Westside Condos Now Selling - Register today for your VIP Platinum Access!